Here is the list of the hotels near Rosenwiller. Book your hotel near Rosenwiller today, Tuesday 14 May for the best price, reservation and cancellation free of charge thanks to our partner Booking.com, leader in on-line hotels reservation. Below here is the list the 50 closest hotels of Rosenwiller, sortable according your criteria. You will find the position of these accommodations on the Rosenwiller hotels map. Hostellerie du Rosenmeer sits at the foot of Mount-St-Odile along the Alsatian wine route. This charming hotel is set in beautiful gardens with panoramic views of the surrounding nature. Guestrooms are decorated with warm wooden furnishings. They come with a private bathroom and a TV. Free Wi-Fi access is also available in the rooms and communal areas. The restaurant serves regional cuisine and local wines. Guests can enjoy meals in the restaurant or on the large terrace with views of the mountains. Free public parking is available onsite. Activities and sights nearby include tennis, hiking, cycling and horse riding. Guests can rent bikes from the hotel to discover the region. Rosheim Train Station is located just in front of the property and gives direct access to Strasbourg and Entzheim Airport. Bed and Breakfast Obernai Preferred hotel ! Located on the wine route in Molsheim, this design hotel is just 1 km from Dorlisheim Train Station. It features a fitness centre and the air-conditioned guest rooms include free Wi-Fi. A flat-screen TV and facilities for making hot drinks are provided in the contemporary rooms, which feature modern furnishings. The en suite bathrooms are fitted with a shower and include a hairdryer. A buffet breakfast is served every morning, and can be taken in the comfort of your room. Enjoy drinks and snacks in the bar at the Best Western Plus Hôtel Le Rhénan. It has a 24-hour reception, and additional services include dry cleaning and luggage storage. Free secure parking is available on site and Strasbourg is a 20-minute drive from the hotel. Entzheim Airport is 19 km away. Hotel Molsheim Preferred hotel ! Le Bugatti is situated in the heart of Molsheim, on the Alsace Wine Route. It offers a fitness room and an organic sauna. The rooms are soundproofed and have a work desk, a telephone and a hairdryer. With modern design features, they also have a flat-screen satellite TV. A full buffet breakfast is served every morning in the dining room at garden level. Additional facilities at Le Bugatti include tailor-made service, iron and laundry services and daily newspapers. Guests can hike along the Wine Route and discover a large selection of wine cellars. The hotel is 19 km from Strasbourg Airport, and 25 km from Strasbourg city centre. It is easily accessible via the A35 and the A352 motorways. Free private parking is available on site. Hotel Obernai Preferred hotel ! This hotel is set in a timber-framed house in the Alsatian village of Obernai, at the foot of the Vosges Mountains. This pet-friendly accommodation offers free WiFi access. All rooms at Zum Schnogaloch are heated and feature carpet flooring and flat-screen TV. Most rooms include en suite bathrooms. Traditional cuisine and regional specialties are offered in the hotel’s restaurant, and breakfast is served at a surcharge at Zum Schnogaloch. The Monkey Mountain in Kintzheim is 35 km away and Colmar is reached by car in 40 minutes. Obernai Christmas Market is 180 meters away, while Strasbourg is a 30-minute drive from the property. Situated in Obernai, One Loft offers accommodation with free WiFi and a terrace. All air-conditioned units include a fully equipped kitchenette, allowing guests to prepare their own meals. A microwave, a toaster and fridge are also offered, as well as a coffee machine and a kettle. Strasbourg is 31 km from the apartment, while Colmar is 49 km away. 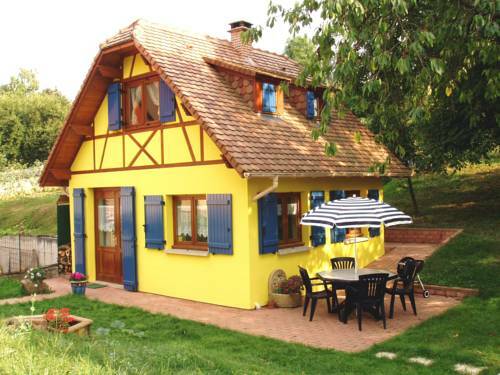 The nearest airport is Strasbourg International Airport, 25 km from One Loft. Premiere Classe Obernai Centre - Gare is situated in Obernai, 24 km from Strasbourg and 44 km from Colmar. Rooms are equipped with a TV and each room comes with a private bathroom fitted with a toilet. There is a 24-hour front desk at the property. Riquewihr is 36 km from Premiere Classe Obernai Centre - Gare, while Rust is 28 km from the property. Strasbourg International Airport is 14 km away. Set within a garden in the centre of the medieval town of Obernai, this former manor house offers a wine cellar, a terrace and a spa with a swimming pool and a sauna. It is just 800 metres from Obernai Train Station. Guest rooms are all equipped with modern en suite facilities and a flat-screen TV with cable channels and some also have a seating area. A la Cour d’Alsace also features a restaurant. You can try French cuisine in the dining room or, in the vaulted-ceiling wine cellar, indulge in Alsatian wines. Located 6 km from the A35 motorway, this hotel is 25 km from Strasbourg. Services include free WiFi and a free parking. Below here is the hotels map of Rosenwiller. Names and details of Rosenwiller hotels can be shown on the map clicking on the prices icons.